Lulus Exclusive! You're guaranteed to turn heads in the Lulus Stunner Rose Gold and Silver Ombre Sequin Bodycon Midi Dress! 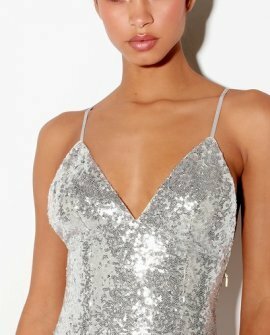 Shimmering silver and rose gold sequins create a gradient ombre effect across this stunning bodycon dress, formed from sheer mesh atop a beige knit liner. Adjustable skinny straps support a princess-seamed triangle bodice atop a figure-flaunting midi skirt. Pair with metallic heels for a night out look! Hidden side zipper/clasp.